Operated by Hotel Collection Indochine, Ana Mandara Ninh Binh brings a wealth of expertise to the region to establish the premier resort of the area. It is a leisurely 90-minute drive from Hanoi. Styled with traditional Vietnamese elements in architecture and furnishings, wedded to cutting edge enhancements and guest comforts, Ana Mandara Ninh Binh also incorporates their environmental commitment throughout the resort. Natural materials are sourced for construction and finishes, while local produce and ingredients are used to create memorable dining experiences. With a total of 172 guest accommodations in villa style, the resort is set in delightful gardens. The three room categories – standard, deluxe and duplex – include guest refinements such as flatpanel TV’s with satellite channels and complimentary wireless internet, minibar, tea and coffee-making facilities and premium personal care amenities. The comprehensive spa and wellness centre at Ana Mandara Ninh Binh offers a comprehensive menu of treatments and pampering administered by caring therapists who are skilled in Vietnamese, Asian and western specialties. There are daily classes of yoga, Tai Chi and meditation. 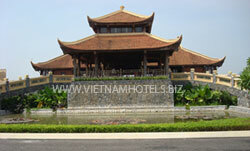 Ana Mandara Ninh Binh offers a total of 172 accommodations in villa-style architecture, and set in tropical gardens. All three categories – standard, deluxe and duplex – offer luxury refinements such as air-conditioning with individual controls, flatscreen TVs with cable channels, complimentary wireless internet, mini bars, tea and coffee facilities and premium personal care amenities. Services include sameday laundry, direct dial telephones, daily maid and turndown, and in-room dining. A central swimming pool offers a great place to relax before, after or as an alternative to sightseeing, and a fitness centre is ideal for a little workout after a day of taking in some of the wonderful attractions of the region. The spa at Ana Mandara Ninh Binh offers a wide range of therapies and pampering, including facial and body massages, exotic body exfoliation and wraps, and aromatherapy. These treatments, together with Asiatic and Vietnamese specialties, sauna and steam, revive and rejuvenate energies whilst relaxing mind, body and spirit. The fitness centre presents state-of-the-art equipment. A choice of dining venues present a wide range of dishes, from the expected excellent Vietnamese cuisine to specialties of the Asian region and western favourites. Guests can also enjoy some great French meals that reflect a recent period of Vietnam’s heritage. There is also a well-stocked wine bar that brings together a collection of labels from both the old and new worlds, and in a price range to suit everyone. A range of local and imported beers are on hand to quench every travellers thirst. In addition to the bars and restaurants, Ana Mandara Ninh Binh enjoys creating unique and personalised dining experiences for guests. Romantic dinner for two, a private barbecue by torch-light with a personal chef, or champagne breakfast at sunrise… the possibilities are almost endless.